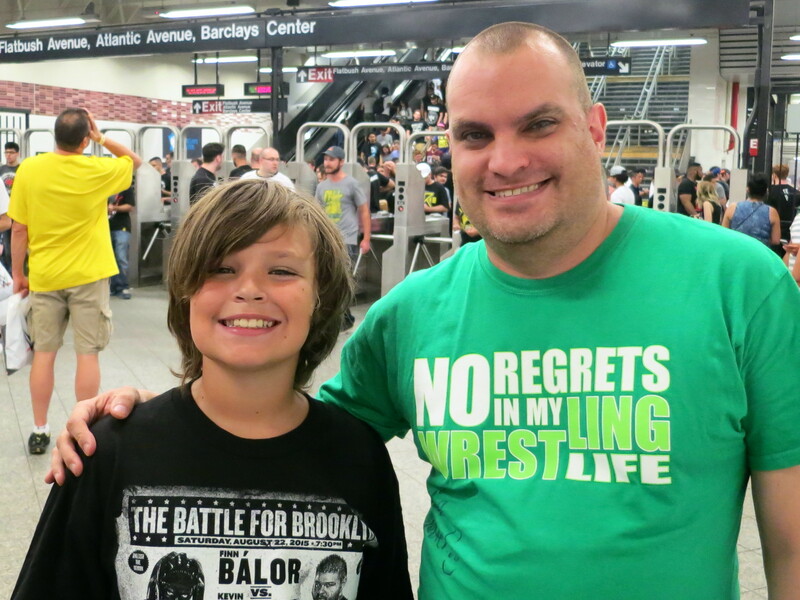 I decided to see NXT Takeover Brooklyn over Field of Honor 2015 largely because that’s what my nephew, who would be visiting at the time, wanted. With all due respect to ROH and the awesome looking show they put on last night, the closer we got to this weekend and the more and more that was announced for NXT the more certain I became that I was lucky the way the decision went. Now having seen Takeover I can’t imagine having missed it. It was a fantastic mix of wrestlers I’ve watched for years in ROH, Shimmer, etc, getting a shot on the “big stage” and unfamiliar newcomers similarly looking for a chance to to step up. And more than a couple of unbelievable moments and surprises. Talk about a packed house. 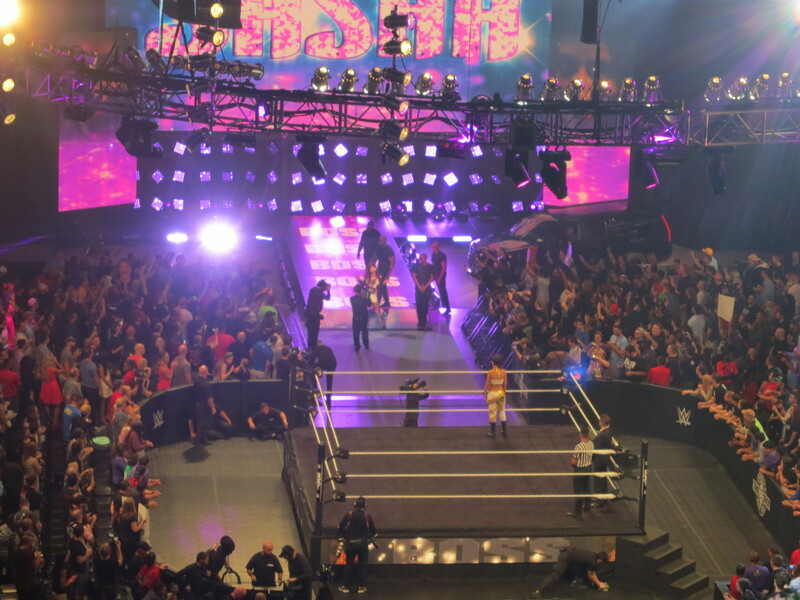 The pre-“ppv” portion of the show started around 7:45. The capacity crowd was pumped up and whoever was in charge of match order and booking certainly knew what they were doing as sending Enzo and Cass out to open turned the hot crowd molten. Enzo Amore, Colin Cassady, Zach Ryder and Mojo Rawley vs Jason Jordan, Chad Gable, Scott Dawson and Dash Wilder was a fun opener that set the evening off on the right note. Eva Marie vs Carmella and Bull Dempsey vs Elias Samson were both short, functional matches that allowed the talent involved to get some experience and further their characters without overstaying their welcome. There were a couple awkward moments, and the crowd was merciless tearing into Marie in general, but these were fine outings for all four. Awesome appearance number one of the evening for me came next, with a fatal four-way featuring Becky Lynch, Dana Brooke, Emma, and Charlotte. I saw a ton of potential in Rebecca Knox’s early appearance in Shimmer, and after a lengthy absence and talk of her career being over due to injury it’s fantastic to see her back, getting a huge opportunity and making the most of it. This was quite good… except for Brooke, who politely speaking has a LONG way to go. Emma, rocking her new heel persona, picks up the win in what looks like it could have been a botched finish. If it was though they recovered very nicely and Charlotte’s visual pin on Emma after the match followed by solidarity shown between her and Becky ended the segment strongly. Triple H came out to hype up the crowd and open the “ppv” portion of the show. 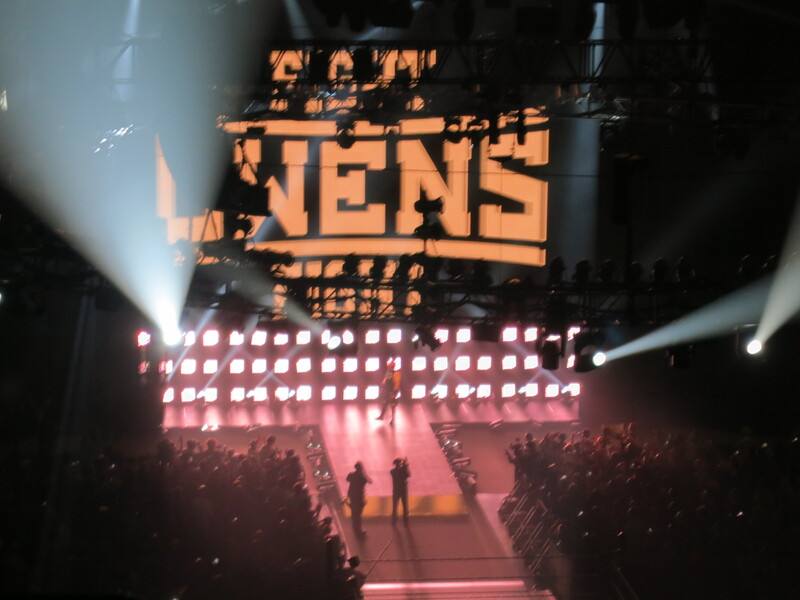 He pitched a cool idea to start the show, with him spotlighted in silence talking about what NXT is and then bringing up the lights to show the sold out crowd going nuts, and most of the raucous Brooklyn crowd actually seemed to comply reasonably well. Hope it came across on screen, because live it was pretty cool. A legend enters his first WWE ring. The first of three downright surreal moments for me was up next as JUSHIN THUNDER LIGER (!!!) entered a WWE ring to face Tyler Breeze. Watching Liger wrestle the likes of Brian Pillman and Chris Benoit many years ago is part of what made me a lifelong wrestling fan so this was quite the treat. Obviously Liger isn’t what he once was, but he still put on a great show against a game Breeze in a basic but thoroughly enjoyable match. Highlights included Liger stealing Breeze’s selfie stick for some posing, diving to the floor, and hitting his trademark Ligerbomb to win. The Wolfpack is shown watching in the front row. I never attended a big ppv event before, so I never realized they bring the stars shown out right before putting the camera on them and then take them right back to the backstage area. Seems very weird – you’d think they’d at least be out there to watch a match. 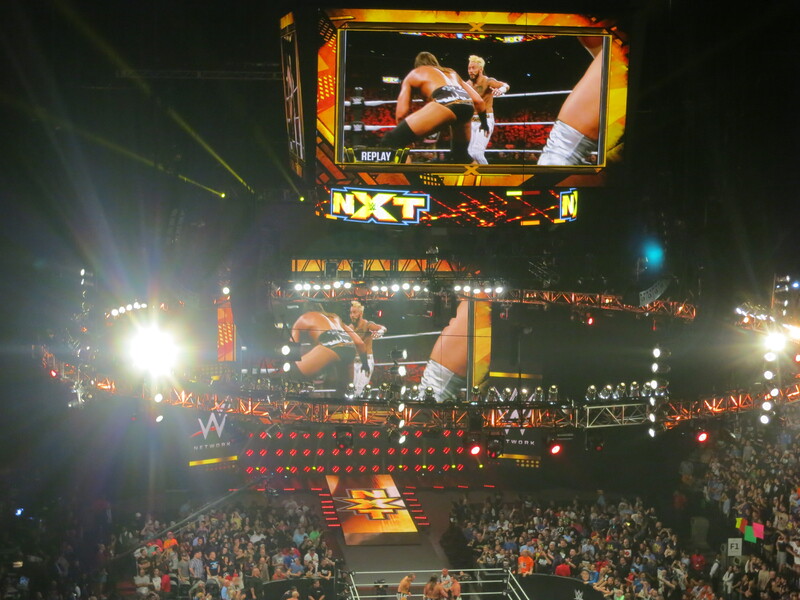 The NXT Tag Titles were on the line next with The Vaudvillains vs Blake and Murphy (c) with Alexa Bliss. Surprisingly hot match, as the crowd was firmly behind the Vaudvillains from the start and got even more so when they announced their counter to Alexa Bliss – Shimmer regular Leva Bates as beloved NXT jobber Blue Pants. This was a solid match with a great finish paying off Bliss getting some comeuppance and providing a surprise title change that the crowd went nuts for. The one man nation has arrived. The debut of indie darling Uhaa Nation, renamed Apollo Crews, was next against Tye Dillinger. The first time I saw Uhaa wrestle live I remarked it was only a matter of time before he got signed. He is unbelievably agile for his size and has the look and bearings of a star. This was a short back and forth encounter that gave Crews opportunity to give the audience a glimpse of what he can do. While I can’t complain about his first impression on people being a standing moonsault, I do kind of wish they let him complete the following half of the Uhaa Combination and hit the standing shooting star. While our seats had a fine view of the action, we were quite far away and the giant screens above the ring were very important to see close ups of the action and key moments. I mention this because during the entire Crews match (and half the ladder match main event) they defaulted to the NXT logo. I’m assuming this was due to technical problems, but in a venue that holds 15,000 people trying to watch a 20′ x 20′ ring you really can’t have this kind of thing happen. Surreal moment number two sees former ROH and TNA world champion Samoa Joe on WWE tv against Baron Corbin. Nice package recapping the feud to bring the audience up to speed. Corbin saying he’s better than everyone else who worked hard to get to NXT because all he had to do was make a phone call countered with Joe saying “they called me” was brilliant. Corbin’s been played up as unstoppable, and I haven’t heard much good about his ringwork but he was fine here going toe to toe with Joe in a strong match. Joe’s victory points towards using him for more than training and putting over new talent, which makes me happy. More superstars marched out to the front row thrown up on the screen and there’s Ric Fl— OH MY GOD IT’S KANA!!!!!!!!! My favorite wrestler in the world today recently announced a hiatus from wrestling in Japan, which apparently might have been code for “I’m negotiating with WWE.” There were rumors and supposition, but seeing her appear at NXT was a complete surprise. So happy for what this could mean going forward, and the fact that they put her next to Ric Flair and Sargent Slaughter and named her indicates that if she has in fact signed they’ll be bringing her in as the top tier talent she is instead of pretending she’s brand new because she’s not homegrown. I’m still in shock from this. Sasha Banks (c) vs Bayley was next for the NXT Women’s Championship. It’s weird how HHH comes across as supportive and important to NXT while Steph seems to be trying to make the spotlight rub off on her and claim credit for other’s success when their promos really aren’t that different. Still, I’ll take the extra attention for the women’s division and having her declare the women’s title match a co-main event was pretty cool. Again the video package summarizing the feud was excellent and effectively conveyed Banks’ dominating, bullying persona and Bayley’s struggle to prove herself and prove herself while being outpaced by her compatriots. Bayley’s another former member of the Shimmer roster, but didn’t get too much time to shine there before being signed to WWE developmental. Both wrestlers were phenomenal here, and this easily took match of the night on a card filled with more established superstars and great performances. Everything was pitch perfect. The in-ring story built move by move and had the crowd captivated the whole way. Banks is so good she had to work insanely hard to get booed by the New York crowd, and still managed it well enough to give the key moments extra impact. The meta-story of Bayley’s struggle and hard fought victory finally proving her legitimacy was amazing, and the crowd erupted for her win. And I’ll be damned if I ever thought someone could make a bell-to-belly suplex a believable finisher in 2015. The “curtain call” moment with Charlotte, Becky, Banks and Bayley was just right. Different stage and name, but same super-awesome Mr. Wrestling Kevin Steen I’ve watched and adored for years. Well, if anyone was going to be able to follow that last match Kevin Steen (Owens) and Prince Devitt (Baylor) are certainly the right choices to try. Steen is an old favorite of mine of the indie circuit and has charisma and presence that’s absolutely captivating. Devitt spent most of his career in Japan, so this was my first opportunity to see him live. 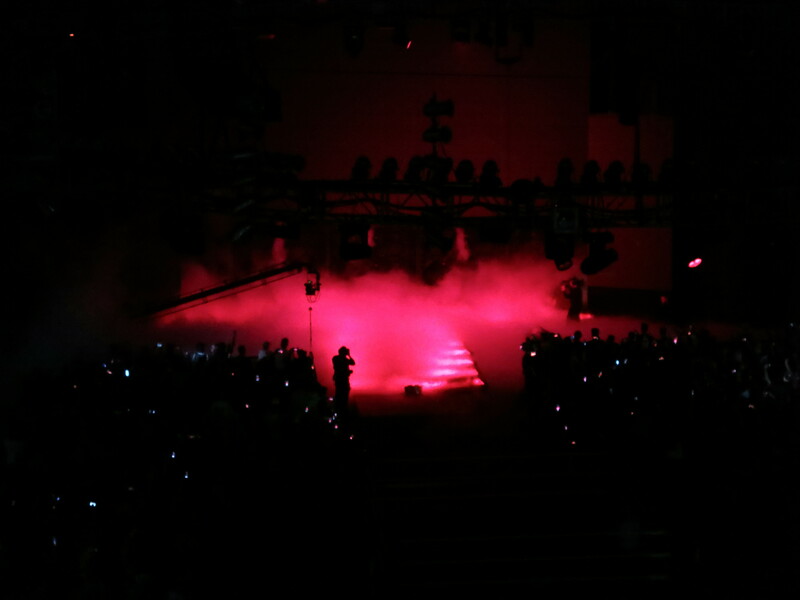 Balor’s entrance live is beyond amazing. The demon emerges for battle. Kevin Owens vs Finn Balor (c) for the NXT Championship in a ladder match was the second and final main event for the evening. 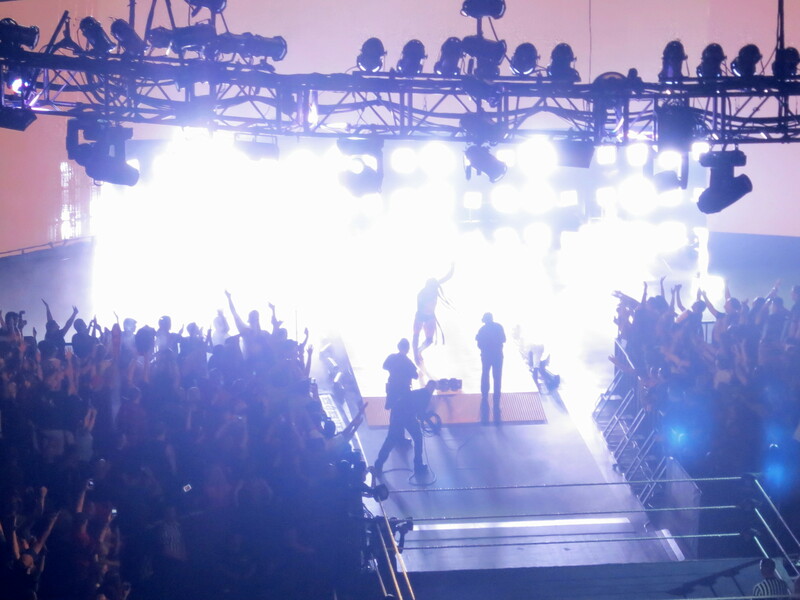 Balor’s full entrance in a packed, full sized arena is a sight to behold. Both wrestlers have legitimate star presence and this match felt like a big deal. This was an excellent ladder based brawl with some brutal spots that didn’t feel excessive or out of place. New York loves Owens, but like Banks he did an impressive job of turning them against him enough for the story of the match to work as it was supposed to. The match kept building and felt like a real, evolving competition with Balor evetnually surviving Owens’ signature hospitalizing powerbomb to the apron to hit a doublestomp from the top of the ladder and retain his title. Perfect end to an incredible show. What a night. Easily one of the best live shows I’ve ever been to, filled with great action, a wonderful roster with diverse styles, and downright magical moments and surprises. Shows like this are why I watch wrestling. Exhausted but deliriously happy on our way home.